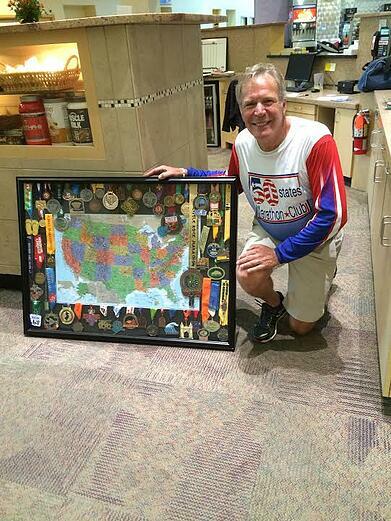 Our very own John Horton has done the unthinkable; completing 50 marathons in all 50 states. What an accomplishment! Read about his journey below! You must have dreams and goals to arrive at your final destination. My dream for retirement was to run fifty marathons in fifty states. I was just turning 60 years old and had not run a marathon in fifteen years. I joined a fourteen-week program with the promise to be able to run a marathon by the end. The training lowered my cholesterol and tri-glycerides and reduced my weight by twenty pounds. That fall I finished the Louisville Kentucky Marathon. The best part of the journey is meeting so many wonderful folks. I met volunteers who gave time and made every effort to assist me in achieving my goal. I met runners who shared a few moments, a few miles, and a part of their lives. I met many folks running their first marathon and achieving a “Bucket List” item. (I always caution these folks that the sport can be addictive!) 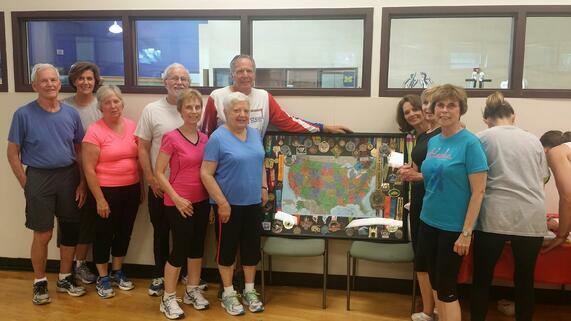 I made lots of Fifty-state marathon friends, who greeted me as an old paland congratulated me on my progress. To all of these folks, I thank you for your support. When you have fun, it changes the pressure into pleasure. Another benefit of running the fifty states is seeing the most beautiful country on Earth. I’ve run marathons around the Grand Canyon, Yellowstone Park, Mt. Rushmore, Newport, Rhode Island, Niagara Falls, and Big Sur in California. I’ve visited the Hiroshima Monument at the end of the Marines Corps marathon, the monument of the Oklahoma City bombing, the Eisenhower Presidential Library in Abilene, Kansas, the Carter Center in Atlanta, Georgia and have run down Bourbon Street in New Orleans. I’ve run alongside the natural beauty of the leaf change in New Hampshire, the desert landscape of Arizona, the Big Sky of Montana, the Amish country of Pennsylvania, and the mountains of Colorado. Each of these places created memories not soon forgotten. My dream begins with me turning into an entrance to Hayward Field. As I come out onto the track I glance up and see a vision of many of the great runners who have finished on this track. As I scan the faces, Steve Prefontaine’s face appears and he smiles and says, “Well done.” My reaction is always the same - my heart starts pounding, tears well up in my eyes, and I feel a surge of energy. My dream has just come true. When folks find out you have run a marathons in 50 states the first question is,” what was your favorite marathon”? Runner’s World magazine lists each year a favorite marathon and I’ve run most of these marathons. Each of these marathons has breath taking scenery, an organized race with friendly volunteers and spectators, a unique medal and good eats after the race. The important things to me are the memories of the race. It might be running a race with a good friend, renewing friendships with old runner friends, making a new friend you see again in a future race, or helping a first timer achieve a “Bucket List” marathon. The race Expo speakers can provide knowledge, answer questions, tell amazing tales of endurance experiences and tell funny stories of their running experiences. For these reasons my favorite is the “Big Sur Marathon”.